11th August 2011. Final winner of the OzHitch/New Member Giveaway announced; New Site Feedback System; New Product Range; How to Get your FREE ExplorOz Window/Windscreen Sticker; NATMAP - available NOW in new version compatible with Windows 7. You don't even need to open the website and your blog will be automatically published, including photos. It also doesn't matter if your phone is out of service. The email will sit in wait until you reach service range (sometimes this can happen overnight in an otherwise patchy daytime service area). Here's some of the recent blogs created from people who used the email blog to send their trip updates. Your seemingly simple little trip snippets quickly clock up well over 200 views, many in the list show over 500 views and others over 800 views, which is equally as high as Forum posts (and sometimes higher) Go on, tease us... tell us how great your trip is going! With Fathers' Day coming up, make a choice to not only get a great present from our online shop enjoying home delivery, but with the knowledge that your purchase helps keep another small Australian business going in these difficult economic times. Keep an eye out for our Father's Day ideas coming next week. Now, you can place Comments, Reviews, and Questions directly on all Article, Trek Note, and Shop Item pages - with your say published automatically into the Forum. This NEW system will ensure quick and varied responses to any queries you may have, and enable discussions in the Forum that are in direct response to site content. The votes are in but the winner will not be announced just yet.... stand-by for more information in our next newsletter. As mentioned in a previous newsletter, you can now choose which colour Window Sticker you'd prefer to place on your van, vehicle, windscreen, or rear window from either BLACK or WHITE vinyl lettering. These stickers are large and long but we have managed to keep the price as low as possible - just $5, or FREE if you are a Member. More Info Here. What are your thoughts about how can we make ExplorOz better? By this, we ask you what new services do you think we could offer? Or perhaps you just want to comment on how we can improve upon what we already do. Have you used all the features of the site? If not, why not? How do you use Trek Notes, how can we improve? How do you use Places, how can we improve? Use our feedback form to tell us your suggetsions. Back after several months out of print this is the LATEST VERSION. This is still the same map content provided in the 2008 Edition, but is now fully compatible with Windows 7. 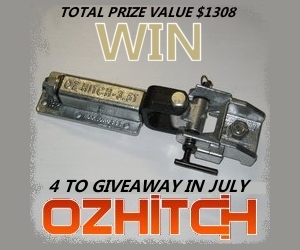 Paul has won an OzHitch 3.5 Tonne Galvanised Trailer Hitch valued at $327. However, Paul must contact us to claim this prize within 1 week or it will be forfeited.